A wanderer’s life was all James Randall Kirkland had known since he was an orphaned boy in San Antonio. And while years of adventure had satisfied his younger self, now he’s longing to put down roots of his own and is prepared to go it alone. But when he sees the Apache slave woman with the startling blue eyes, the course of his journey is changed forever. Ever since the Comanche raided her village and took her for their own, Millie hasn’t known any kind of freedom. After years of being outcast, beaten and traded from tribe to tribe, she’s unprepared for James’s patient tone and gentle ways. Still, as her handsome savior slowly earns her trust, Millie struggles between desire and fear, sure it’s just a matter of time before James tires of her and her burgeoning feelings are nothing but another wasted memory. 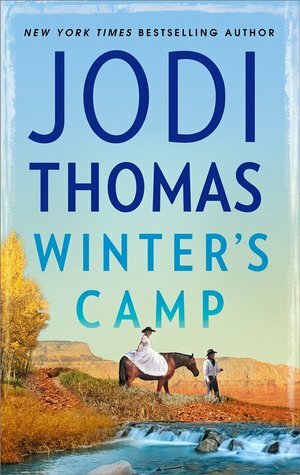 Winter's Camp is a Western set in Texas at a time when land was just beginning to be divided up for ranches and towns for the white people. 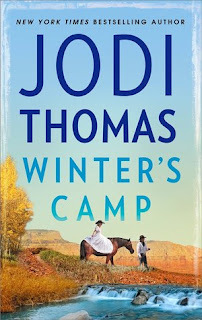 This book is a prequel and kicks off a new series by Jodi Thomas - the Ransom Canyon series. It's a short and gentle story, giving the background to the beginnings of the new town. James is a kind but resolute man. When he spots Millie being mistreated as a slave he buys her for 'nothing', because she is regarded as nothing. Millie is at first reticent and unsure. However as James' kindness continues she begins to open up. So much so that by the time he is ready to start his new holdings she is ready to find herself before she gives herself to anyone. When James seeks information about her family he finds out that one of them is still possibly alive. James tracks the family member because he wants Millie to be happy. But will doing this be a mistake - one he comes to regret? I always enjoy a western, a left over from reading my Dad's westerns as a child when I couldn't find anything else. Winter's Camp promises an interesting new series and I look forward to reading Ransom Canyon very soon. It sounds like a really sweet read.